My grandmother, Raleigh Mae Farrar, communicated regularly with most of the families on the Next-of-Kin list she received from the War Department. I believe she wrote to every single family, and she saved letters from all of the families except for the McMann family and the Henson family. As a future post will discuss George McMann, I’ll concentrate on William Alvin Henson II, the navigator serving with the Buslee crew on the Lead Banana on September 28, 1944, in this one. William Alvin Henson II was the original bombardier on the Gerald B. Sammons crew. 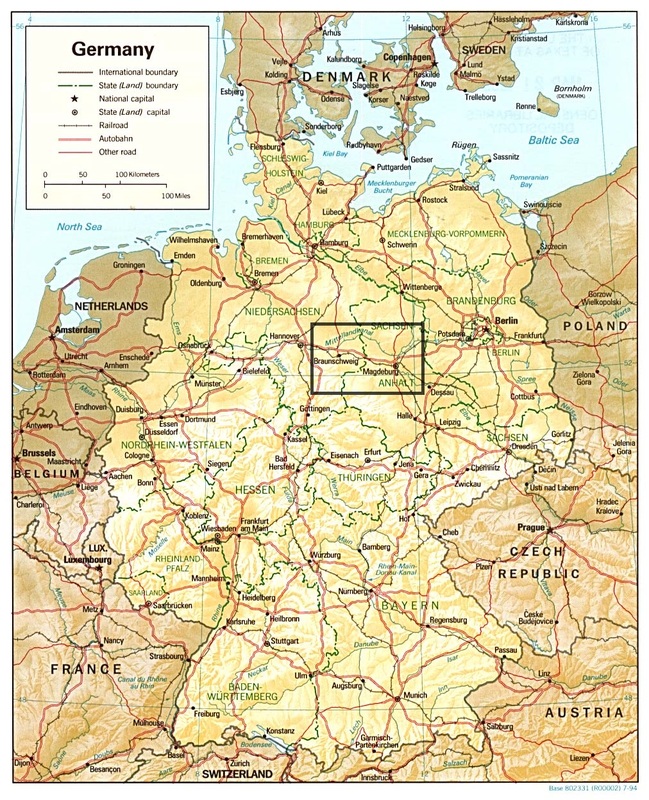 Henson’s first mission was mission 109 on May 19, 1944 to Berlin, Germany. Henson flew his first four missions with the Sammons crew. 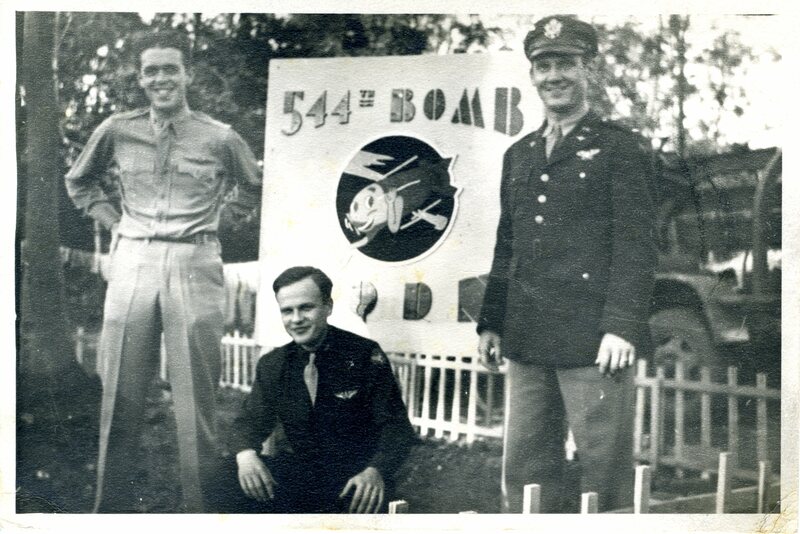 On their second mission, Group B, including the Sammons crew, did not locate the formation and had to return to base with their bomb load, resulting in no credit for this mission. Henson flew eleven total missions as a bombardier, earning ten mission credits. His last mission as a bombardier was mission 142 on June 21, 1944, again to Berlin, Germany. At this point, Henson retrained as a navigator and flew his first mission as navigator on the Alfred H. Cole crew on mission 162, July 20, 1944 to an aircraft industry target in Dessau, Germany. Just like his second mission as a bombardier, his second mission serving as navigator on the Cole crew on mission 163, July 21, 1944 to Schwabisch Hall, Germany, the crew could not locate the formation after taking off late and turned back while still over England. Again, no mission credit for this one. Henson flew seventeen total missions as a navigator, earning sixteen mission credits. On his twenty-sixth credited mission, William Alvin Henson was flying as navigator aboard the Lead Banana with the John Oliver Buslee crew on September 28, 1944. It was the third time he had flown with the Buslee crew. He had replaced Chester Rybarczyk as navigator just the day before on September 27 and a few weeks earlier on September 3. He had most recently been flying with the Harold M. Toler crew. The Toler crew didn’t fly on September 3 or 27, and then Toler flew as pilot under Commander William T. Johnson as the high group lead on September 28. Henson spent his last hours in the nose of Lead Banana with bombardier Robert Sumner Stearns, who was serving with the Buslee crew for only the second time. Henson and Stearns both flew the prior day, September 27, with the Buslee crew. 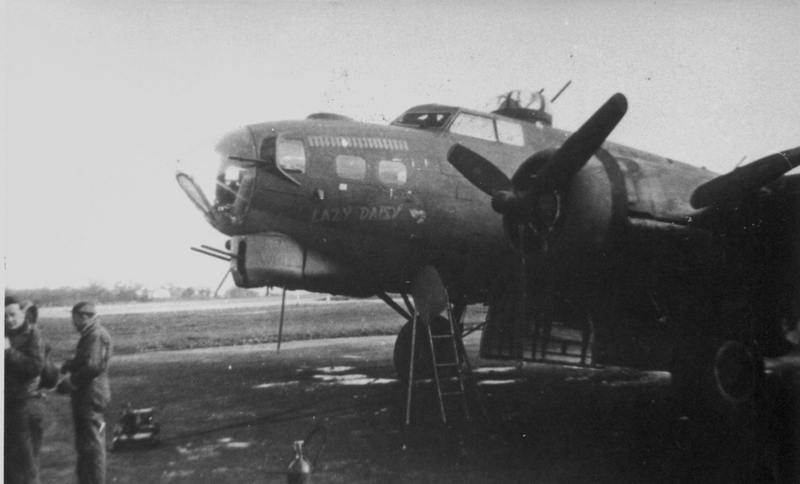 They had released their bombs on Magdeburg and had turned for home when their wing found themselves on a crossing course with another group. Their group had to move quickly and in the confusion Lazy Daisy veered out of formation, just narrowly missing Wallace Storey and the Kenneth Gross crew, due to Storey’s quick reaction and move to get out of the Daisy’s way, and collided with Lead Banana. A handful of men were able to exit the two planes, but most were trapped inside, including William Alvin Henson II, without a chance to escape as the planes plummeted to earth. William Henson was married to the former Harriet Whisnant of Summerville, Georgia. Harriet was listed as next-of-kin on the War Department’s Next-of-Kin document. Henson’s parents, Mr. and Mrs. W. A. Henson lived in Atlanta, Georgia at 2398 Ponce de Leon Avenue, N.E. back in 1944. 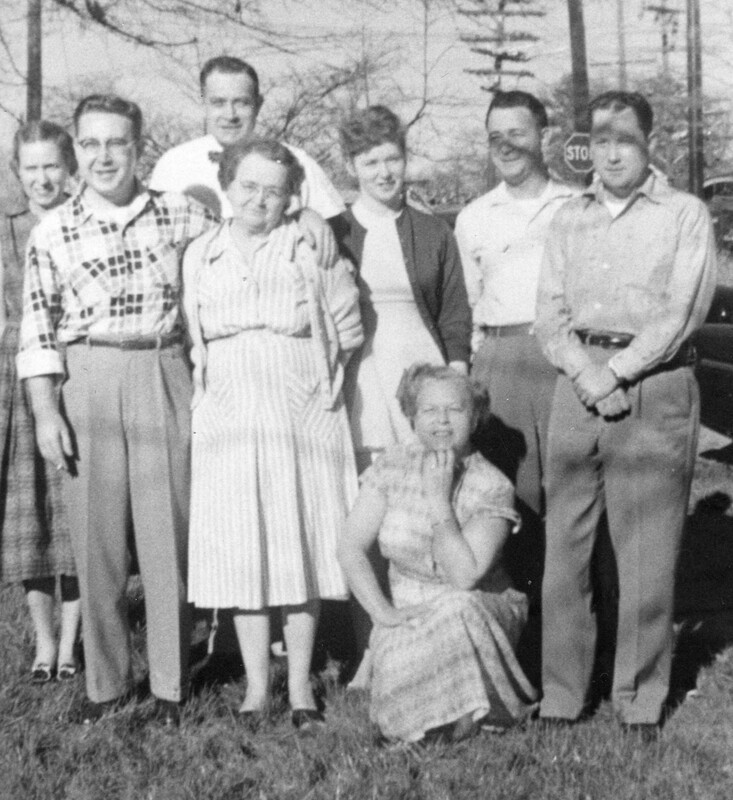 My grandparents, Raleigh Mae and Carroll J. Farrar, lived fairly close to the Hensons, only about seven miles away at 79 East Lake Terrace in the Kirkwood neighborhood of Atlanta. I can only assume that my grandmother gleaned this information from Henson’s obituary in the Atlanta Constitution newspaper, which listed their address. 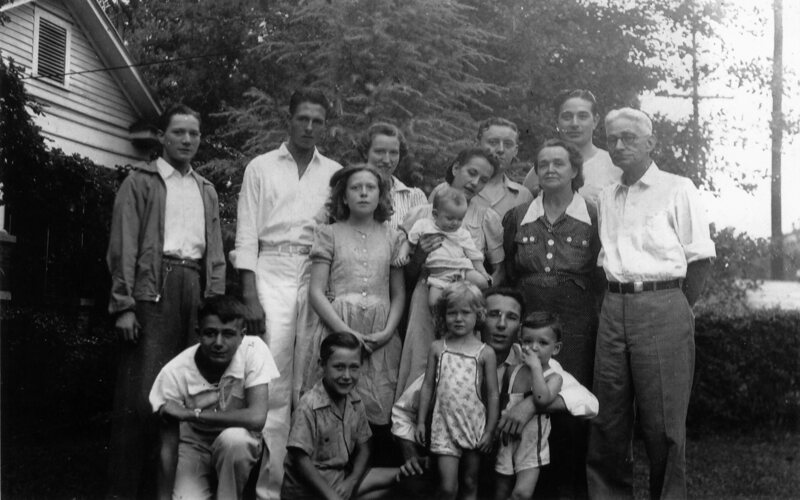 I also believe that my grandmother and the Hensons communicated by telephone as they lived only seven miles apart and would not have to pay the very high long distance telephone rates that they would have incurred had they been in different parts of the country. Perhaps they even visited with each other, although I don’t have any record of it. I believe this explains the lack of letters from the Hensons. First Lieutenant William A. Henson II, 21, of the Air Corps, reported missing in action over Germany since September 28, was killed in action on that date, the War Department has informed his family here. Henson graduated from Conyers High School in 1940. He completed two years at The Citadel in Charleston, South Carolina before he enlisted in the Air Corps in October 1942. 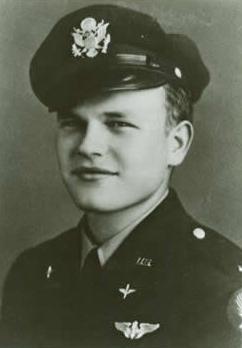 He received his wings at Vitorville, California, December 4, 1943. He went overseas with the Eighth Air Force in April of 1944 and had completed 26 missions. He won the Air Medal with three (another clipping states four) oak leaf clusters for “meritorious achievement.” He also was awarded the Distinguished Flying Cross and the Purple Heart. He was flying as lead navigator on a B-17 when his plane was shot down. He is survived by his wife, the former Miss Harriett Whisnant, of Summerville, and a two-week-old daughter; his parents, Mr. and Mrs. W. A. Henson, of 2398 Ponce de Leon Avenue, N.E., and Conyers, Ga.; two sisters, Miss Jeanne Henson, of Shorter College, and Mrs. C.R. Vaughn, Jr., of Conyers; an uncle, C.W. Hall, of Valdosta; two aunts, Miss Lillian Henson, of Valdosta, and Mrs. L.E. Harold, of Crystal Springs, Miss. Assuming the clippings were printed shortly after notification of his death, his daughter was probably born around December 10, 1944, just a couple of days after Lead Banana co-pilot David Albrecht’s daughter was born on December 8 in California. Neither Henson nor Albrecht would ever have the chance to meet their daughters, and their daughters would never have the chance to know their fathers. William Alvin Henson II was born June 8, 1923. 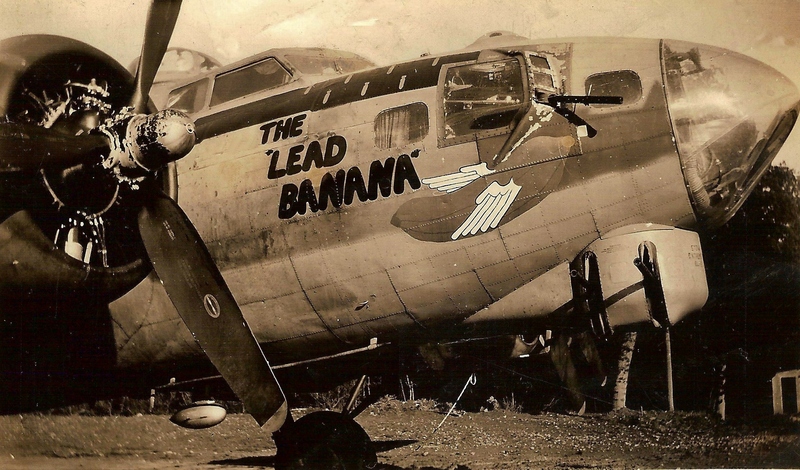 He was 21 years old when he lost his life on September 28, 1944 in the mid-air collision of Lead Banana and Lazy Daisy. He is buried in the East View Cemetery in Conyers, Georgia. 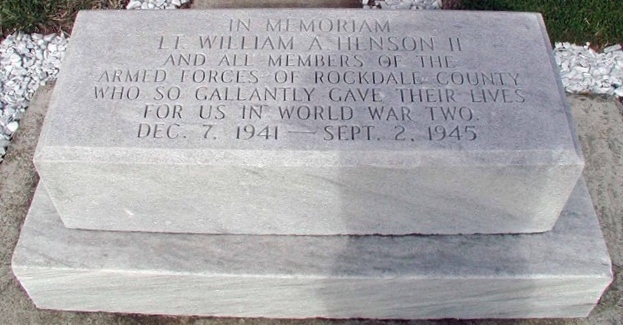 A memorial to Henson and others who lost their lives in WWII is located near the flag pole at American Legion Post 77 on Legion Rd. in Conyers, Georgia.